On the face of it, you wouldn’t pick DenDD vs. PixelFire to be a classic Counter-Strike match. They’re minor professional teams, far below the level of the Fnatics or Na’Vis of the world. But last weekend, they ended up making history: the first map of their best-of-three went into triple, then quadruple, and finally quintuple overtime. By the time the last shots were fired, they had played 79 straight rounds, in the longest match in the history of Counter-Strike LAN tournaments. Both were fighting to survive the group stage of the European Minor Championship in Bucharest, which would guarantee $2500 in prize money and a semifinal appearance. Minor stakes compared to what fans of top-tier Counter-Strike have gotten used to, but important to both teams. DenDD is best known as an online team, full of good Swedish players who’ve not quite made the jump to major teams and offline tournaments. PixelFire was a new name for a hard-working, journeyman team. Just over a week earlier, they had broken with their parent organization over an attempt at match-fixing. Counter-Strike maps are played for 30 rounds, and the first team to win 16 of those rounds wins the map. After 15 rounds, the side switch and the attacker becomes the defender and vice versa. If the score is tied at 30 rounds, they play an overtime period of ten rounds, and again until there is a winner. DenDD got off to a great start on the counter-terrorist (CT) side of the Mirage map, but stumbled badly when it came time to play the terrorist (T) side. This isn’t unusual for Mirage, which gives the CT side a real defender’s advantage and requires some real finesse and planning from the T side. But DenDD started to collapse, allowing PixelFire to come back from a ten round deficit and force the first overtime. According to Greer, neither team really had the experience or the confidence to go that second route. So both teams went into overtime with a defensive mindset. The result was a tie, and then another, and then another. Both teams played it safe to start with and quickly lost the ability to ramp things up, admitted Erik “zende” Sundeqvist, who played with DenDD during the match. The game was getting more conservative and clumsy as the match dragged on, but it was also becoming the focus on the Counter-Strike community. As their third overtime came down to another tie, the word started to get out that something very unusual was happening in Bucharest. In some ways, the small stakes and the low-profiles of the teams make the story more poignant. It’s easy to to see why players devote their lives to a game when they’re playing on a massive stage in front of thousands of fans, with hundreds of thousands of dollars in prize money on the line for the team that proves itself the best of the best. But if that’s the pinnacle of pro Counter-Strike, the game’s soul is found in those hard-fought duels in the trenches of the pro community, between almost unknown teams and players who are playing for pride, and the chance to get just one step closer to their dream. In front of a half-exhausted, half-amazed audience of Counter-Strike fans, DenDD and PixelFire went into their fifth overtime. Both teams were getting more desperate to find a way to break the stalemate. In the end, Pixelfire managed break the tie. They managed to take the bomb site as terrorists, plant a bomb, and then wipe-out the DenDD team as they attempted to storm the position. It had taken over three hours to get that result, and that was only the first map in a best of three. Zende agreed. “The loss was really hard for us. It’s easily the most heartbreaking map loss in my career. We had played so long, really played our hearts out, but in the end we couldn’t win any of those match points,” he said. Though he also admitted that, as the overtime progressed, the DenDD squad started joking with each over the comms about how badly they were choking, and when they finally lost, they were a little relieved just to be able to stand up and get some fresh air. Greer admired what the teams had done that day, even if it wasn’t always pretty. They were, he pointed out, pretty young players and teams compared to the veterans you find at the elite level. “These teams just need a bit more exposure, a few more events like this, and they’ll be getting to this state of world-class play,” he said. Experience comes with time. 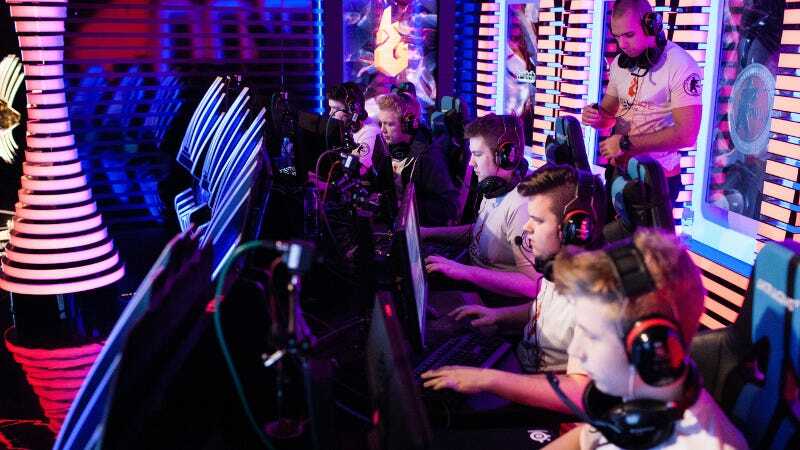 But the ten players who competed across 79 rounds of Counter-Strike proved to the world they are some of the most doggedly determined, tireless players in the game. Big tournaments come and go, but people will remember the quintuple overtime between DenDD and PixelFire for a long time to come.